In the Antibody Production and Vaccination unit will will learn how immunity is based on the fact that an animal's body can recognize cells and proteins that are of "it-self" and distinguish those that are foreign or 'nonself'. We will learn how foreign material can be identified and destroyed. Immunity is based on recognition of self and destruction of foreign material. 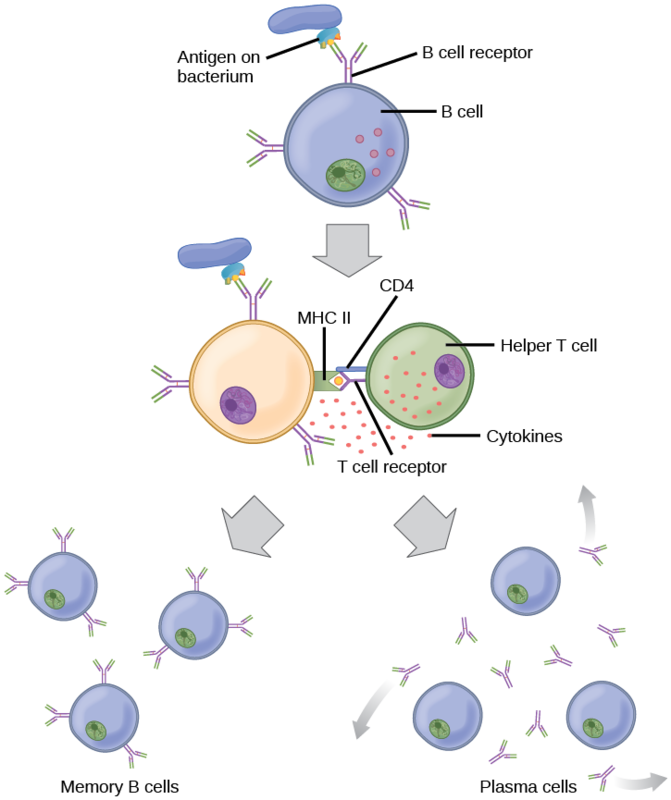 An antigen is a molecule capable of inducing an immune response to produce an antibody in the host organism Sometimes antigens are part of the host itself in an autoimmune disease. Antigens are "targeted" by antibodies. 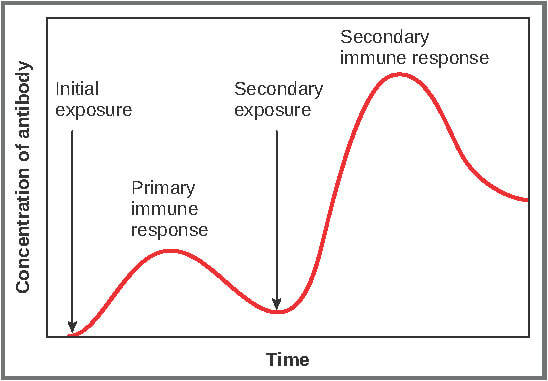 Each antibody (immune response) is specifically produced by the immune system to match an antigen after cells in the immune system come into contact with it; this allows a precise identification or matching of the antigen and the initiation of a tailored response. 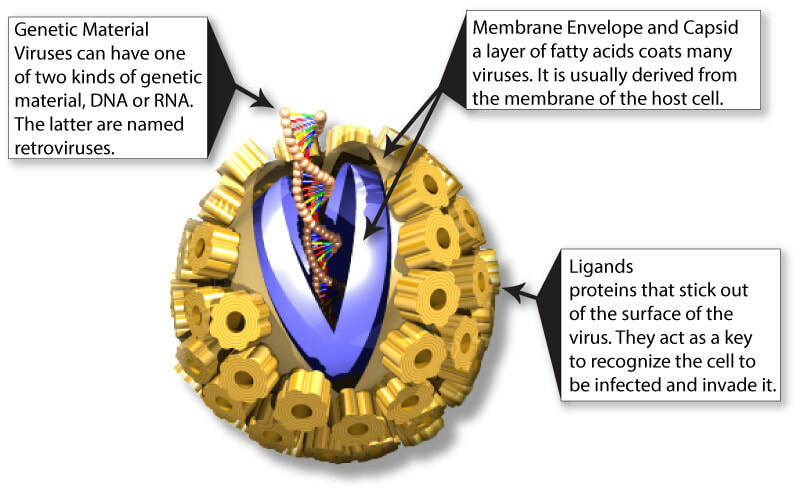 When a pathogen enters the blood, the specific antigen on the surface of the membrane is identified. Specific phagocytes known as macrophages recognize a pathogen as a foreign entity because of the antigens on the surface.. The macrophage engulfs and partially destroys the pathogen. The macrophage takes the antigens from the destroyed pathogen and displays them on the surface of the cell bound to a membrane protein called a MHC protein (called antigen presentation). Plasma cells are specialized B lymphocytes (called B cells as they develop in the bone marrow) that secrete a large amount of antibodies during a selective immune response. Since they are a cell that produces and secretes a large number of antibodies (proteins), they contain an extensive amount of rER, ribosomes and mitochondria (for energy). 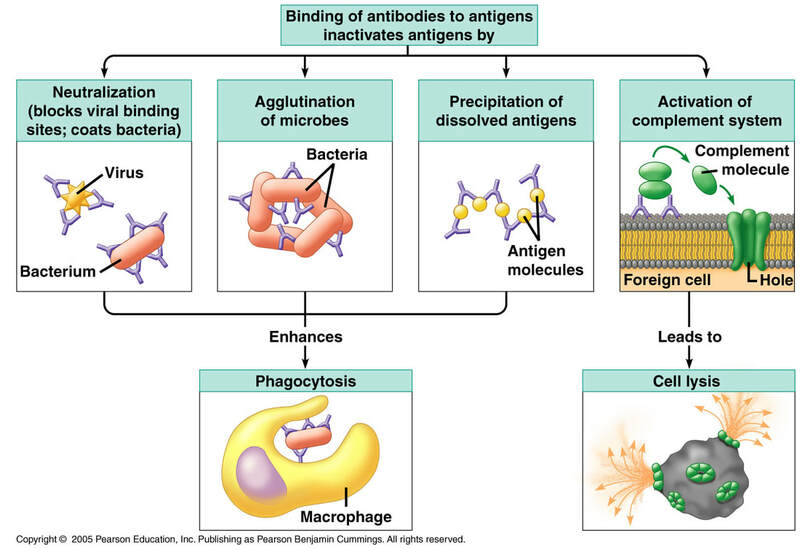 Agglutination – Antibodies cause the sticking together of pathogens by attaching to the antigens on the surface. These clumped masses of pathogens are then easily ingested and destroyed by phagocytes. The large agglutinated mass can be filtered by the lymphatic system and then phagocytised. Opsonisation – Antibodies make pathogens recognizable by binding to them and linking them to phagocytes. Neutralisation of toxins – Antibodies bind to toxins produced by pathogens in the blood plasma preventing them from affecting susceptible cells. Complement activation – The complement system is a collection of proteins which ultimately lead to the perforation of the membranes of pathogens. 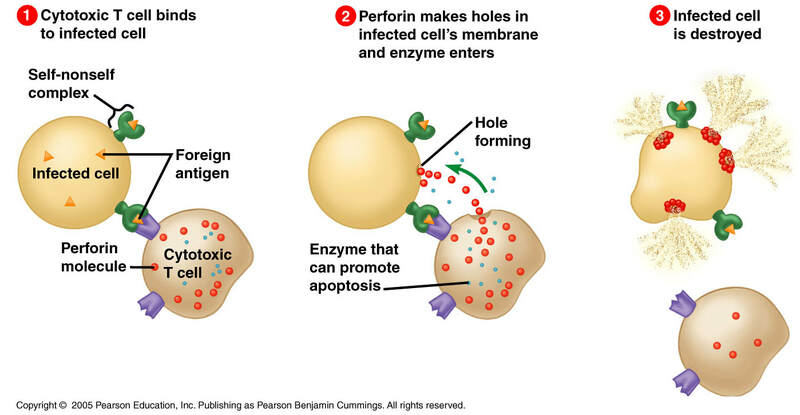 Antibodies bound to the surface of a pathogen activate a complement cascade which leads to the formation of a “membrane attack complex” that forms a pore in the membrane of the pathogen allowing water and ions to enter into the cell, causing the cell to lyse. Neutralisation of viruses and bacteria – Antibodies can bind to the surface of viruses, preventing them from entering host cells. Immunity is the ability of an organism to resist a particular infection or toxin by the action of specific antibodies or sensitized white blood cells. 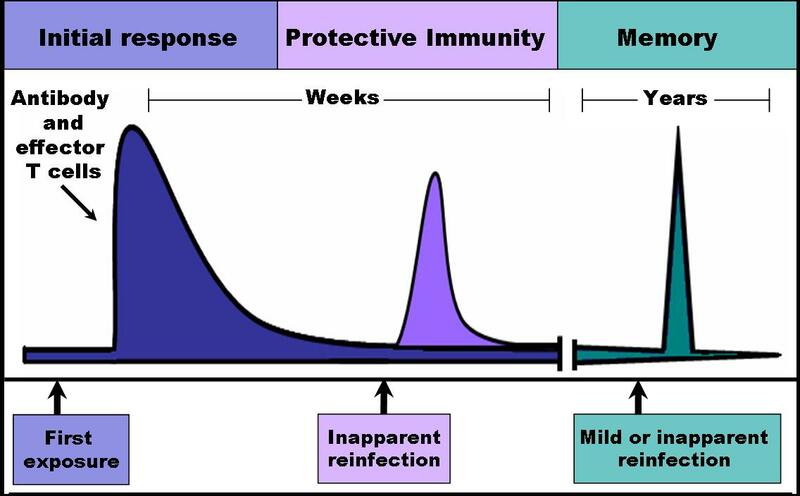 Immunity develops when the immune system is challenged by a specific antigen and produces antibodies and memory cells in response. 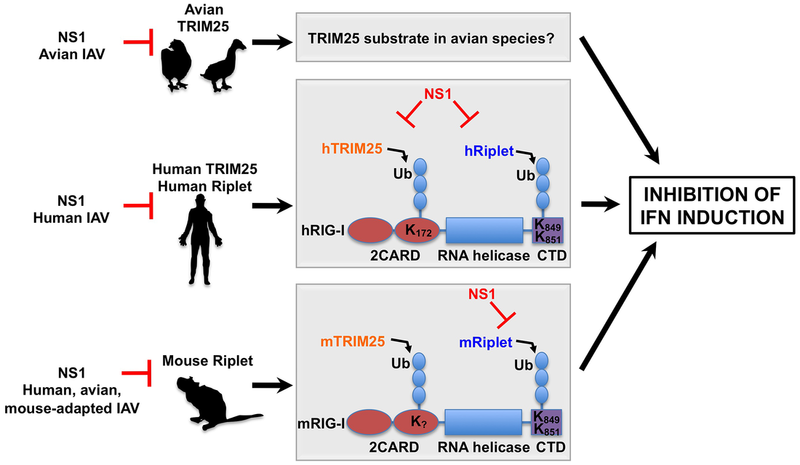 Memory cells ensure that the second time an antigen is encountered, the body is ready to respond rapidly by producing more antibodies at a faster rate. Vaccines are introduced to the body usually through an injection but can be administered through orally or through a nasal spray. Vaccines contain a live attenuated (weakened) or killed version of the pathogen, its toxins or one of its surface antigens. Vaccines help to stimulate a primary immune response. Histamine is an important protein involved in many allergic reactions. Allergies are caused by an immune response to a normally innocuous substance (i.e. pollen, dust) that comes in contact with lymphocytes specific for that substance, or antigen. In many cases, the lymphocyte triggered to respond is a mast cell. 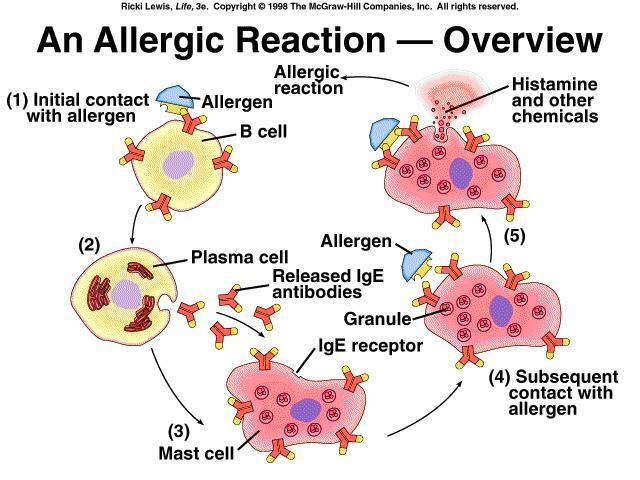 For this response to occur, a free-floating IgE (an immunoglobulin associated with allergic response) molecule specific to the antigen must first be attached to cell surface receptors on mast cells. 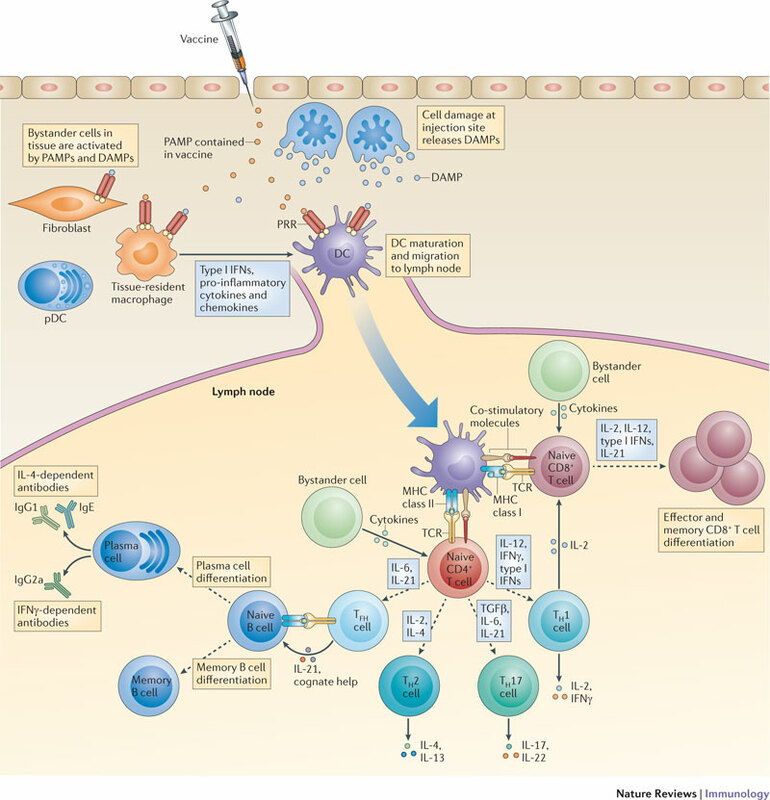 Antigen binding to the mast cell-attached IgE then triggers the mast cell to respond. This response often includes the release of histamine. It causes contraction of smooth muscle and dilation of capillaries. ​Histamine causes many of the symptoms of allergies, such as a runny nose or sneezing. When a person is allergic to a particular substance, such as a food or dust, the immune system mistakenly believes that this usually harmless substance is actually harmful to the body. In an attempt to protect the body, the immune system starts a chain reaction that prompts some of the body's cells to release histamine and other chemicals into the bloodstream. The histamine then acts on a person's eyes, nose, throat, lungs, skin, or gastrointestinal tract, causing allergy symptoms. NOTE: this is why people with allergies take antihistamines! Monoclonal antibodies are highly specific, purified antibodies that are produced by a clone of cells, derived from a single cell. They recognise only one antigen. 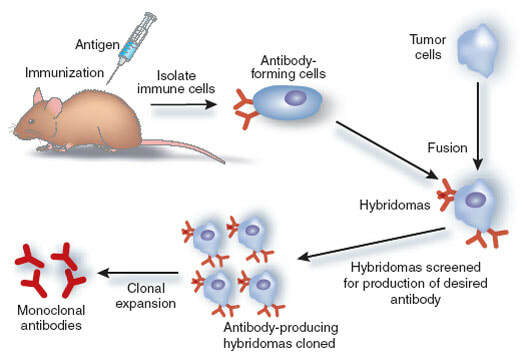 To produce the clone of cells that will manufacture a monoclonal antibody, the antigen recognised by the antibody is injected into a mouse, or other mammal. In response to this challenge, the mouse's immune system makes plasma B cells that are capable of producing the desired antibody. Plasma cells are removed from the spleen of the mouse. They will be of many different types with only some producing the desired antibody. The B cells are fused with cancer cells called myeloma cells. The cells formed by fusion of plasma B cells and myeloma cells are called hybridoma cells. Monoclonal antibodies are identical antibodies produced by clones of a single parent immune cell that are specific to one type of antigen. 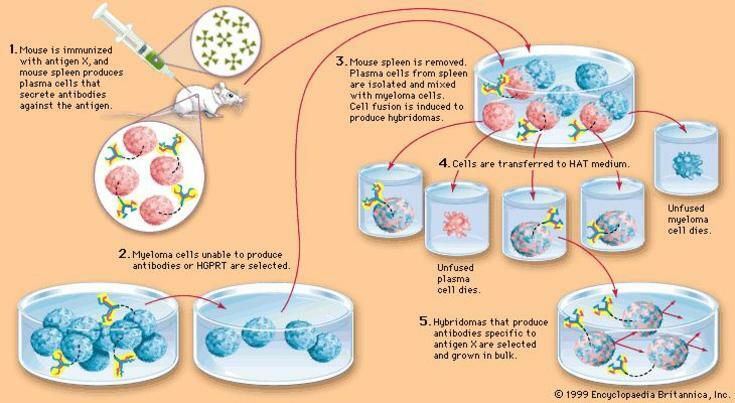 A laboratory animal such as a mouse is injected with a specific antigen that corresponds with the needed antibodies. After the animal goes through a primary immune response, a plasma B-cell cell that produces the required antibody is removed from the spleen. Myeloma (cancer) cells are cultured in a petri dish. These dividing myeloma cells are mixed together with the plasma B-cells and are treated to promote a fusion between the two cells, forming a cell called a hybridoma. The successful hybridomas have characteristics of both cells; produce antibodies and divide rapidly for a long time. These hybridoma cells are cultured and allowed to divide, producing many clone cells that are able to produce large amounts of antibodies. 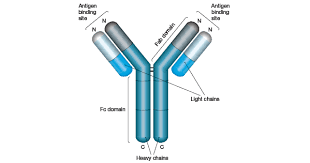 Monoclonal antibodies can be extracted and used for many different applications. 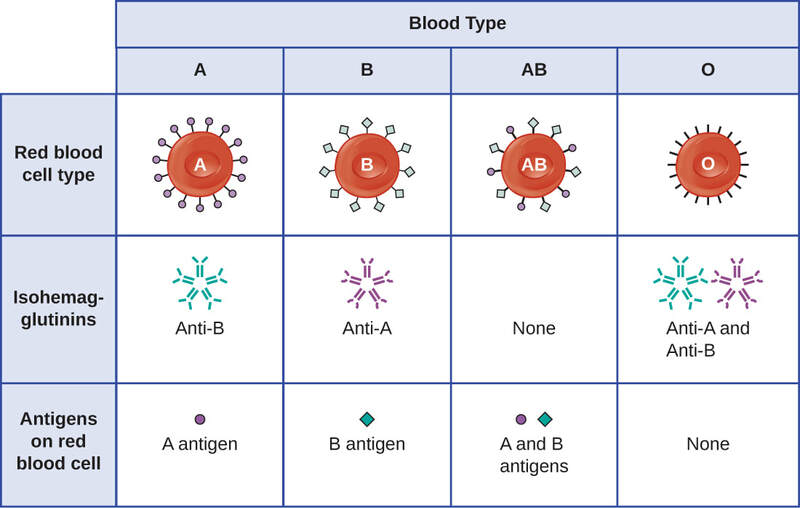 Blood types are determined by the presence or absence of certain antigens – substances that can trigger an immune response if they are foreign to the body. Since some antigens can trigger a patient's immune system to attack the transfused blood, safe blood transfusions depend on careful blood typing and cross-matching. 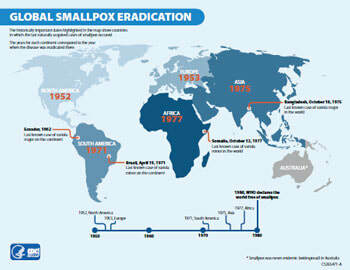 In 1959 a global initiative was undertaken by the WHO in order to eradicate smallpox. The effort had mixed results until a well-funded Smallpox Eradication Unit was formed in 1967. 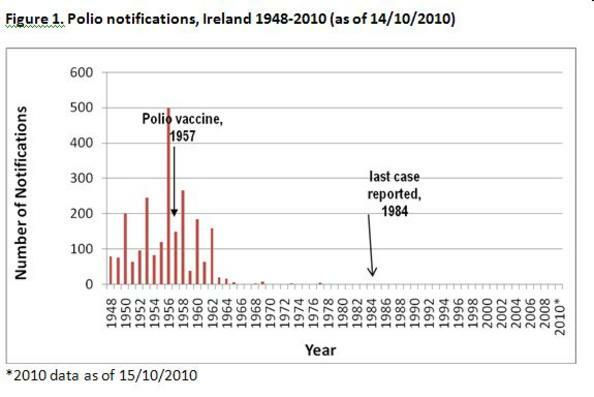 The last known case of smallpox was recorded in Somalia in 1977. 11.1 A 3 Monoclonal antibodies to HCG are used in pregnancy test kits. (Oxford Biology Course Companion page 475). ​Describe a pregnancy test strip works, including the role of free and immobilized monoclonal antibodies. Human chorionic gonadotrophin (HCG) is produced by an embryo in early pregnancy. 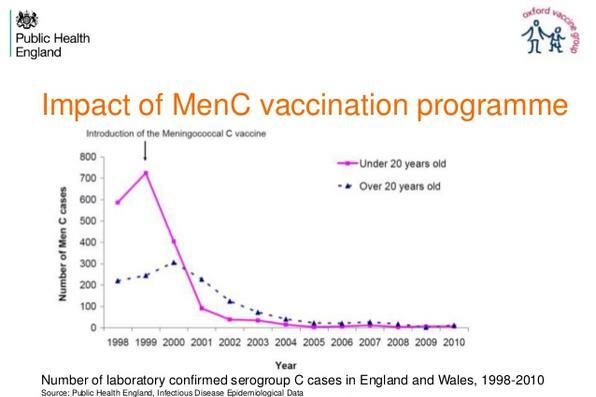 Monoclonal antibodies can be produced by injecting a lab animal with HCG, as it recognizes this as antigen. HCG Antibodies are combined with color-changing enzymes. When the mixture is introduced into a blood sample of a woman that is pregnant, theantibodies will bind to the HCG in the blood, causing a change in color. If the woman is not pregnant, no HCG will be present in her blood, and therefore there will be no color change. Monoclonal antibodies are produced using the method described in 11.1.5. The antibodies are injected directly into the person after a possible rabies infection. The antibodies will control and fight the infection, giving time for the body to produce its own antibodies. If not treated with antibodies after a rabies infection, death can result. The World Health Organization initiated the campaign for the global eradication of smallpox in 1967. The campaign was deemed a success in 1977, only 10 years later. The first ever vaccine was created when Edward Jenner, an English physician and scientist, successfully injected small amounts of a cowpox virus into a young boy to protect him from the related (and deadly) smallpox virus. But how does this seemingly counterintuitive process work? Kelwalin Dhanasarnsombut details the science behind vaccines. Fewer children in the United States are getting vaccinated. That’s bad news for those kids, and also for public health in general. Often, the response is to argue and debate and get angry at people who are we see as making terrible, irrational decisions. Instead of doing that, let’s use science to understand why this is happening in the first place. Luckily, we live in a time where we don't have to worry about smallpox anymore. It's a horrible disease, but through smart vaccination techniques, we took it from killing millions worldwide, to being eradicated from the planet! The benefits of vaccines far outweigh the minuscule risks, but some parents still question their safety. John Oliver discusses why some people may still feel uncertainty about childhood vaccinations. What are allergies? How are they caused, and what can people do to prevent them? SciShow explains! Quick Questions explains why, when it comes right down to it, there are really only eight kinds of people in the world. Over-the-counter pregnancy tests give potentially life-changing results with a pretty high rate of accuracy. But how do they work? Tien Nguyen explains how each test performs a scientifically rigorous, multi-stage experiment that goes from start to finish in the time that it’ll take you to watch this video.